I was given the opportunity by Theralight, Inc. to review this product. All opinions are my own. I love a multipurpose product. I'm trying to actively declutter our home, and products that can be used for multiple things, and on the whole family, are super convenient. My most recent product find is Thaumaturgic Bio Mist. BabyCakes and Hubs both have sensitive skin and eczema so I have to be very careful about what I purchase for them. Thaumaturgic Bio Mist is a cosmeceutical-grade, pure and stable product designed to support the skin's natural defenses against many skin conditions and is formulated for all skin types. It doesn't have any of the bad ingredients: sodium sulfates, parabens, fragrances, or artificial colors. For myself I've used it on my face when it is particularly inflamed because of acne. I've also used it on shaving bumps to reduce irritation and on chub rub! For BabyCakes I've used it on her itchy skin from eczema, on her scratches that comes from eczema irritation and on the scrapes she gets while playing. It's really great to have products around that I can use on all of us, for multiple purposes, and I don't have to worry about the ingredients. HOCl is the magic ingredient that makes Thaumaturgic Bio Mist special. It mimics the natural molecules that work as part of our body’s defense mechanism. 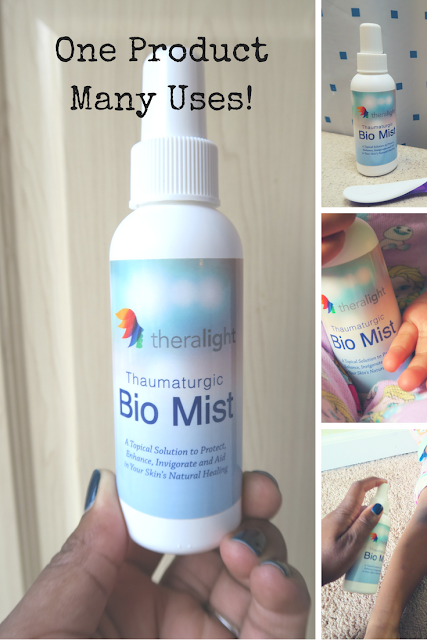 Check out Thaumaturgic Bio Mist for your family today!